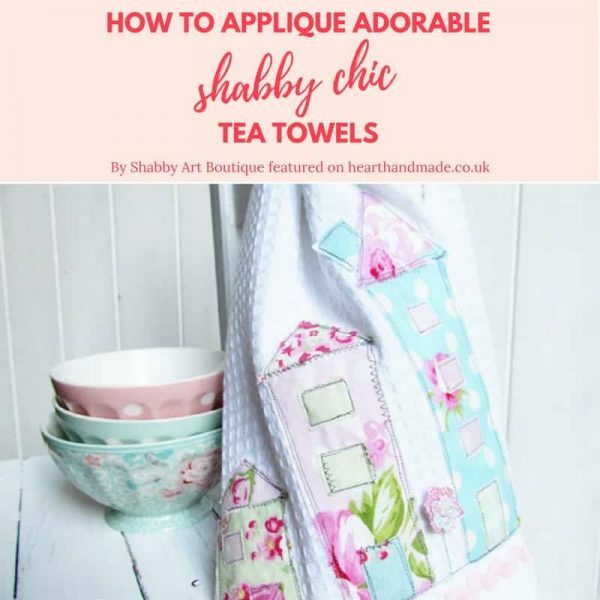 So today I am super happy to share a guest post from Kerryanne over at The Shabby Art Boutique. 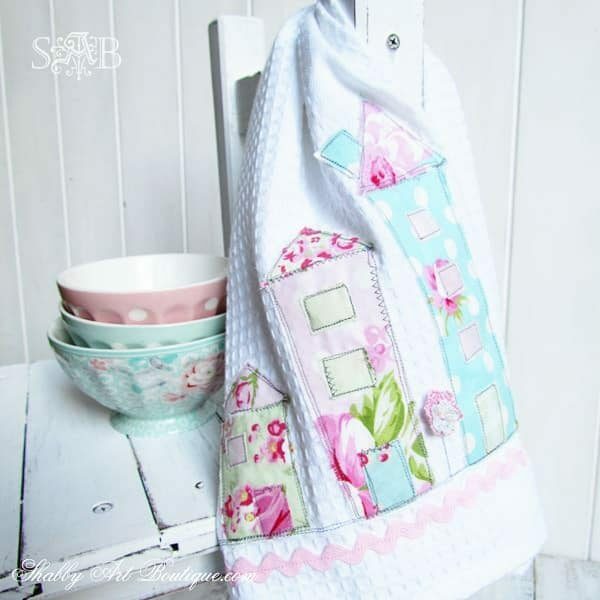 Have you always wanted to learn how to applique but didn’t know where to start? Why not start here. 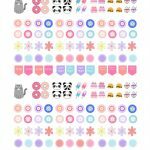 Kerryanne’s brilliant tutorial is not a conventional one by any means, and that’s because there’s no pattern. Such fun! All the fabric is cut by hand and the project is made up of a series of rectangles and triangles. 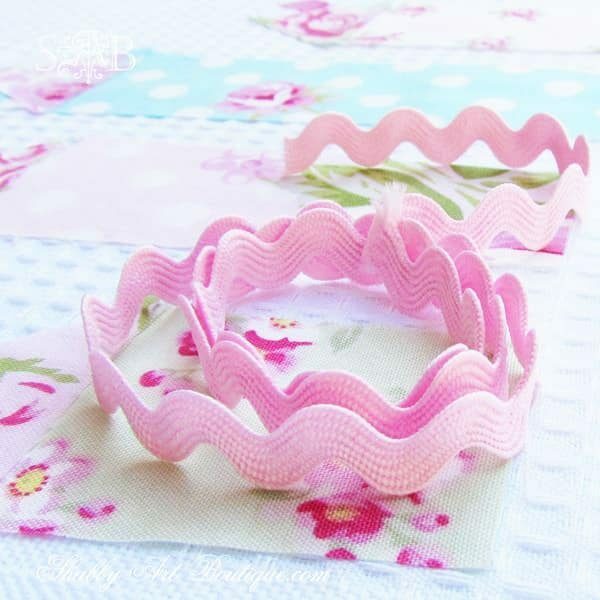 A variety of fabric scraps – this project was produced using this amazing Tanya Whelan Rosey fabric in pink, aqua and mint. Ric-Rac – in a coordinating colour. White and grey sewing cotton. Sewing machine and usual sewing supplies. Wash and dry all of your fabrics to allow for shrinkage. 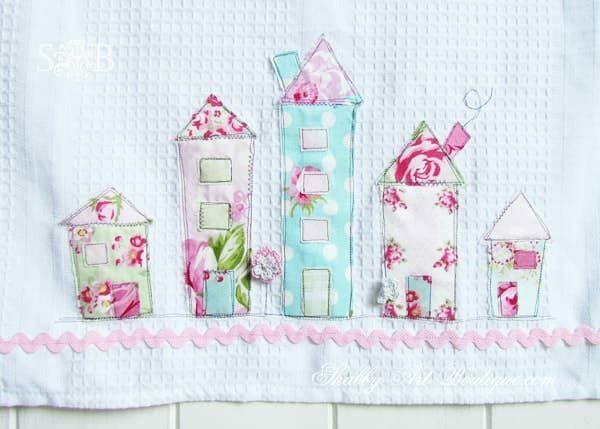 Iron your applique paper to the back of your scraps of fabric. 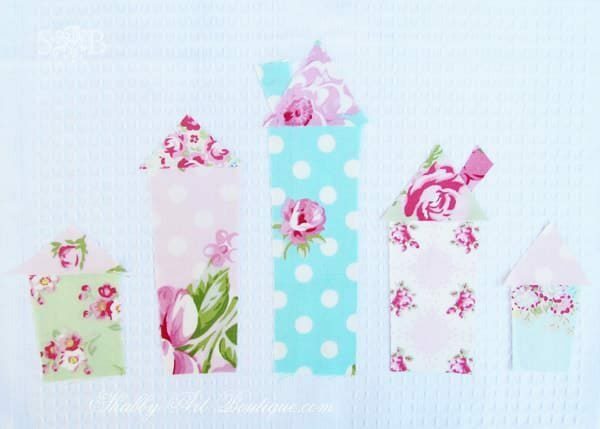 Cut out the shapes that will make up your houses don’t forget that there’s no need to measure the fabric, the quirkier the better. 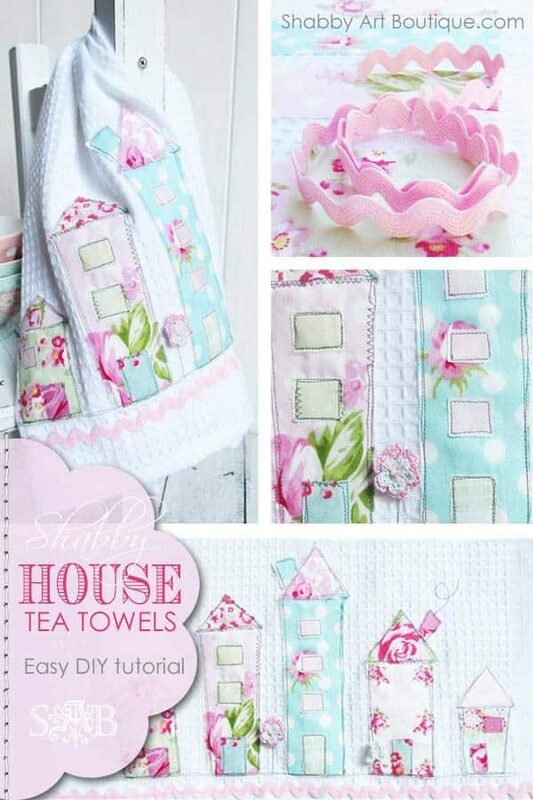 Remove the backing from the applique paper and position on your tea towel. Once in place use a dry iron to adhere. Cut out the windows and doors and iron in place. Thread the sewing machine with white thread on the bobbin. Make sure and use a darker thread through the machine. 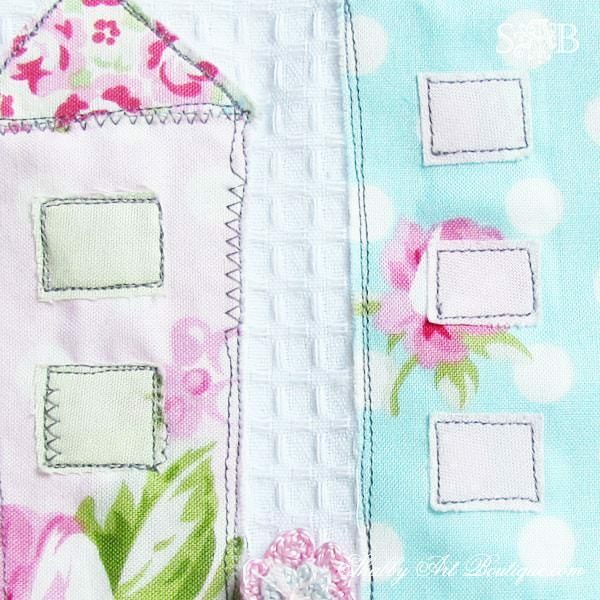 Then sew around the edges of the houses and the little windows and doors, have fun with your stitching. 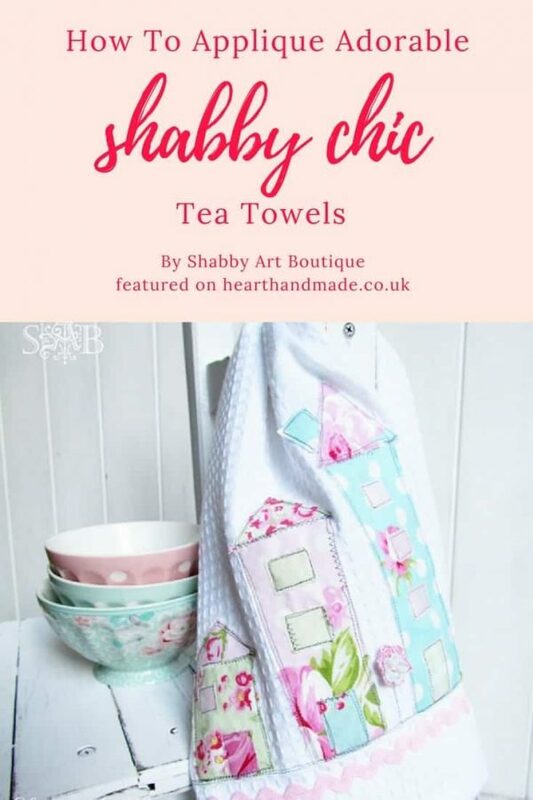 Tie off and secure any loose ends of cotton thread on the reverse of the tea towel. Finally, sew a wide piece of Ric-Rac below your houses and voila. 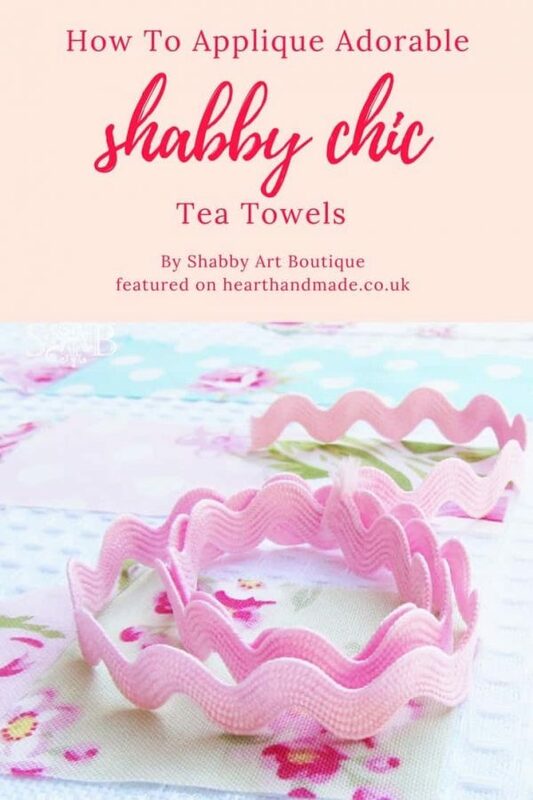 Really flex your creative muscles try using any embellishments you fancy. 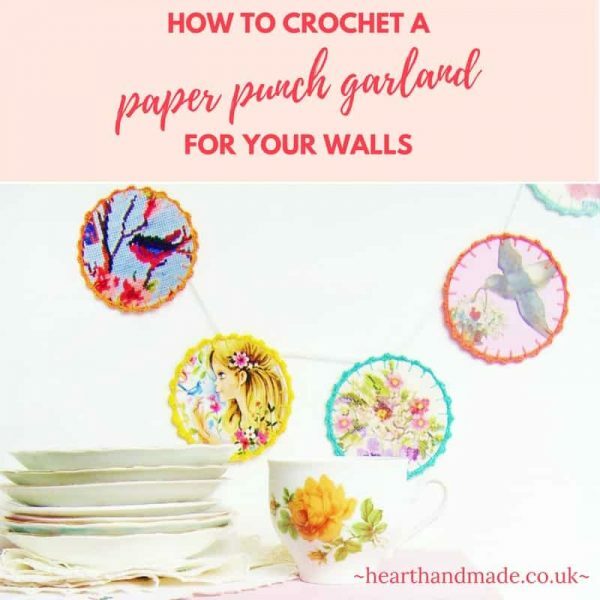 I hope that you’ve enjoyed learning how to applique with Kerryanne. What is your next applique project going to be? I love this so much! Thank you for partying with us. So pretty, what a lovely simple idea beautifully done. Can’t wait to try applique. 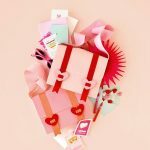 Thanks for sharing at the #InspirationSpotlight party @DearCreatives Pinned & shared. I am so in love with this project! Very pretty! Love the free style way these are done. Thanks so much for the inspiration Claire. Pinned.